This bronze vignette cleverly captures the joy of a newly engaged couple. 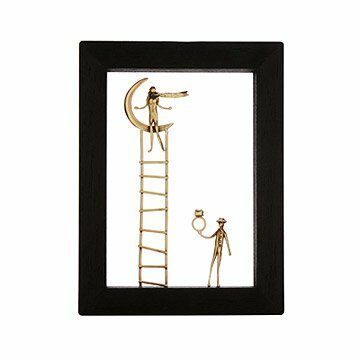 For a couple who is over the moon about each other, George Roumanas's Ayous wood shadowbox display is an engaging tribute to the magic moment when they made it official. The artist breathes life into molten bronze by sculpting the warm-hued metal into a pair of lovebirds taking the next step. Handmade in Greece. Take a tour of George's Athens studio and take in some of his own words of wisdom on the blog. George Roumanas hails from Petrítsi, a village in Southern Greece renowned for its idyllic environs. Like the artists who flock there from around the world, George is influenced by his lush surroundings, as well as the imaginative work and creativity of the makers who call Petrítsi home. The self-taught artist brings common experiences, concepts, and emotions—love, dance, music, family—to life by combining wood, stone, and other natural materials with manmade ones, like glass and bronze. Vendor is based in Greece - Producton of about 90 pcs is 3 weeks for the artist. The Perfect 50th Anniversary Gift! This was a gift for my aunt and uncle's 50th anniversary. They loved it! It's hard to purchase art for someone else, but this is really a classy piece, and small enough that it will be easy to find a place to display it. I am confident that it will be a favorite engagement gift to enjoy for years to come. I was unaware that the piece had no back; a unique and pleasing feature. It is a charming piece and the sentiment was perfect as an engagement gift. The proposal was a total surprise elaborately planned on a Southern California beach. quality and a simple elegant design. Charming.